After the sun-filled family vacations at the shore, poolside lounging and outdoor excursions, the fall season is something to look forward to. Crisp autumn air, bold colors on the trees and the start of fall festivities all bring a welcome change. As summer rolls into fall outside why not bring a change of seasons indoors by transforming the look of your home. Whether you’re looking for easy and affordable ways to make small changes or an entire redecoration, Gail Gray Home Furnishings and Design can help. 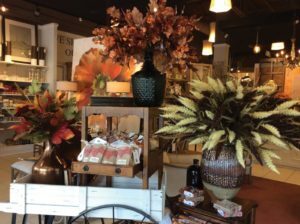 Located at the Promenade Shops in Saucon Valley, Proprietor Gail Gray-Dunn has been helping to furnish clients homes since 2000. She has won numerous awards including two time winner of the ARTS award for Best Home Accents Store and Top 50 Retail Star and most recently, Best of the Valley 2017 for Interior Design. “If you’re looking to freshen things up inside your home with small and affordable changes, think accessories,” says Audra Hill, an Interior Designer at Gail Gray. Hill brings a personal history in furniture design and enjoys showcasing her creative style with clients. Hill also suggested that purchasing a few new pillows are also a great way to change the look of your room. In addition to changing up you accessories, try changing the placement of furniture and rugs for a totally different look. By changing your floorplan and not putting everything against the walls, your room can look more warm and inviting. With the “less is more” design trend, try removing a shelf in a bookshelf and add in a family photograph to make it look cleaner. Updating artwork can help, too. Warming up white interiors with coppers and other beautiful fall colors is an easy way to soften up a neutral interior. Gray continues to be very stylish and because it’s not a strong color, any additional colors you add will make the room pop. However, color is very personal and Hill knows it’s more important to assist clients based on their personal style preferences over trendiness. Interior Designers at Gail Gray offer a wide variety of personal services. If you’re looking for simple updating, designers will happily come to your home and work with you on an hourly basis to show you how easy it can be. Or, if you’re looking for a major change, designers will work with you every step of the way to completely transform your room(s). 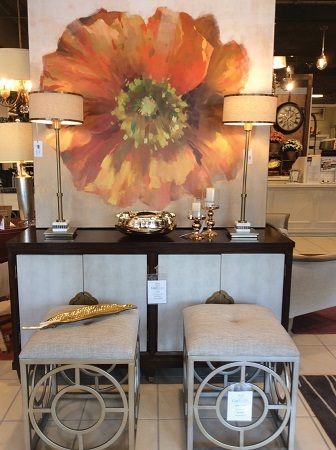 Gail Gray offers complete room design (including kitchens), painting, wallpaper, carpeting, area rugs and runners, window treatments, lighting, furniture reupholstery, and of course, beautiful furniture and accessories. You can even custom design your solid wood dining table through a Canadian company, Bertanie. Choose a finish, paint, distress level, table leg and fabric. Household items need not be removed as sometimes, simple reupholstery does the trick. Mixing and matching old with new can make a big difference. And, with store sales taking place throughout the year, you’ll almost always find savings. 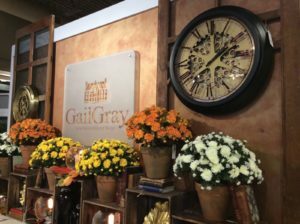 Gray-Dunn attends many trade and design shows as well as furniture and accessory markets to find new treasures and interesting pieces to make your home stand out. The store layout is always changing, more often than the seasons, and leisurely walking through it you’ll find beautifully “staged” rooms with very different looks like traditional, modern, beachy, country – something for every taste.